Sound-power level LWA in dBA i frequency bands to inlet, outlet and environment of the fan. The total sound power level dBA at 3 m distance. The frequency band has eight wave groups. Each group has a definite mediumd frequency: 63 Hz, 125 Hz, 250 Hz, 500 Hz, 1000 Hz, 2 kHz, 4 kHz and 8 kHz. Any noise is distributed to definite frequency bands and the sound energy is dissipated to various frequency. The sound produced by the operating fan is spread along the air duct, partially attenuates inside the unit and penetrates through the grilles inside the premise. 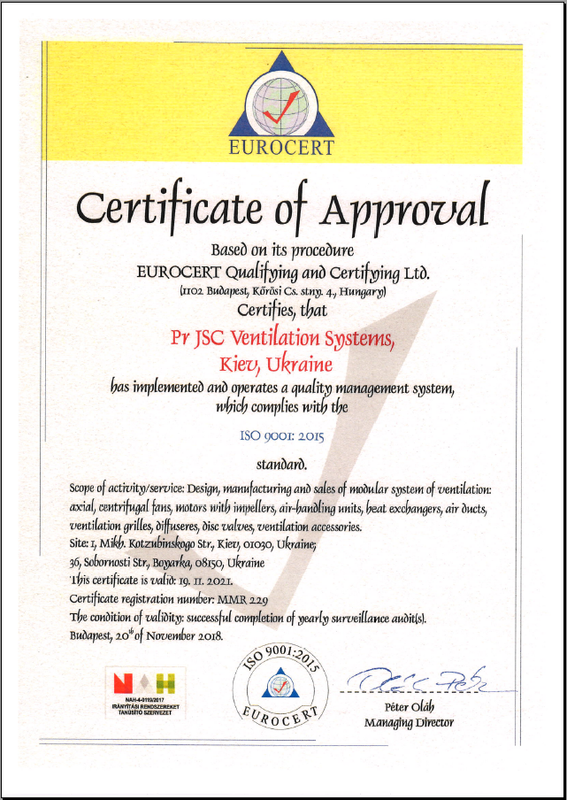 Ventilation system design is based on acoustic calculation which is an integral part of any premise ventilation design. The calculation is aimed to define the octavefrequency band in the operating points and the required sound attenuation level by means of comparing this spectrum with the permissible values according to hygienic regulations. After selection of construction and acoustic means for sound attenuation the expected sound-pressure levels are tested to check the efficiency in the selected operating points.